The United States Environmental Protection Agency (EPA) revised the 1992 Agricultural Worker Protection Standard* (WPS) reg ulation on November 2, 2015 to increase protection from pesticide exposure for the nation’s two million agricultural workers and their families. The implementation date of the Revised WPS was January 1, 2016. 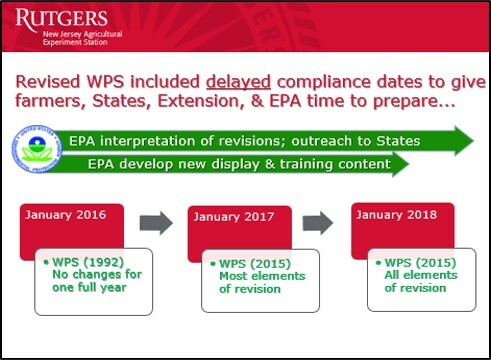 But, the 2015 Revised WPS included delayed compliance dates. The revised regulation required no changes from existing 1992 WPS requirements until January 2, 2017. Most of the revised WPS requirements became effective on January 2, 2017, with the exception of three items: 1) new content added to training; 2) new content added to the pesticide safety poster; and 3) handlers suspending applications if anyone is in the “application exclusion zone”. Full compliance, including those last three items, will be required one year later on January 2, 2018. Regarding training content, agricultural employers can continue to use existing EPA-approved worker and handler training resources until January 1, 2018 (through the 2017 growing season). This date will be later if EPA has not provided outreach materials with the expanded content. For 2018, EPA is required to develop the training materials with new required content in worker and handler training. Employers must implement the new training curriculum by January 2, 2018. This date, too, will be later if EPA has not provided outreach materials with the expanded content. If this were to occur, training on the new content would not be required until 180 days after EPA announces the training materials are available. Our Pesticide Safety Education Program (PSEP) has developed a Rutgers NJAES Worker Protection website for information and resources to assist agricultural employers and licensed Private Applicators with the new regulations. This website includes videos to use for 2017 & 2018 training, Rutgers WPS outreach schedule, WPS contacts, and more…and will be updated as new information becomes available. To keep in the know, enroll in the WPS “PSEP Posts” blog (enrollment box at the very bottom of the left menu of the webpages of the website). Please contact PSEP Coordinator Pat Hastings for further information. *Note: The revisions to the Worker Protection Standard [40 CFR part 170] were published in the Federal Register on Tuesday November 2, 2015 [under the authority of sections 2 through 35 of the Federal Insecticide, Fungicide, and Rodenticide Act (FIFRA)].